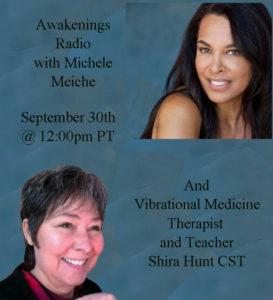 Shira joins forces again with Michele Meiche on “Awakenings,” BlogTalk Radio on Wednesday, October 18th @ approx. 09:45 am HST / 12:45 pm PDT (show starts at 09:00 am HST / 12:00 pm PDT). This Is a show you will want to hear! Access the recording here. An interview with Shira on Metaphysical Talk Radio (http://www.metaphysicaltalkradio.com), first aired on Wednesday, October 5th, 2016, by Inger Purifory. This is the prelude to the start of our own radio show, coming soon on MTR (Metaphysical Talk Radio). More information can be found here. 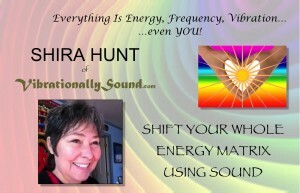 An opportunity to hear Shira explain about frequency therapy, how she dramatically became involved with this fundamental mode of healing, and to learn how it underpins everything we are and do – because everything that manifests here always begins its creation in the realm of frequency / energy. Shira’s process is a simple portal to first seeing (quite literally) and then changing your whole energy matrix, in order to bring any manifested imbalances back into healthy and happy alignment. This is the way to shift every aspect of your life, your world. 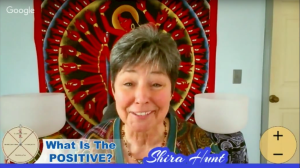 Hear Shira and V Lynn Hawkins discuss how Frequency Therapy, which creates harmonic balance, affects every aspect of Life, including supporting the creative process, thus promoting leadership and its ensuing business success. Wise Words from Shira & Michele Meiche on “Awakenings” (BlogTalk Radio) about the present Energetic Re-Alignment that we are all experiencing right now. Shira comes into the program around 01:01:50. Some Vibrationally Sound “specials” were also unveiled during this airing! You can listen to the recording of this live call here! There are also presentation slides associated with this seminar. 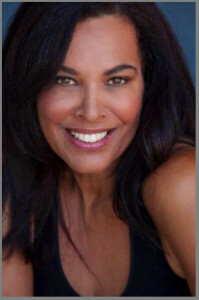 The links below are the radio interviews that Michele Meiche did with me from California on Awakenings Radio. Thank you, Becky Meagher, with Transitions TV. Becky invited me on the TV show in 2013. We taped two episodes and I had a great time sharing the Vibrational Medicine work with Becky and her audience.